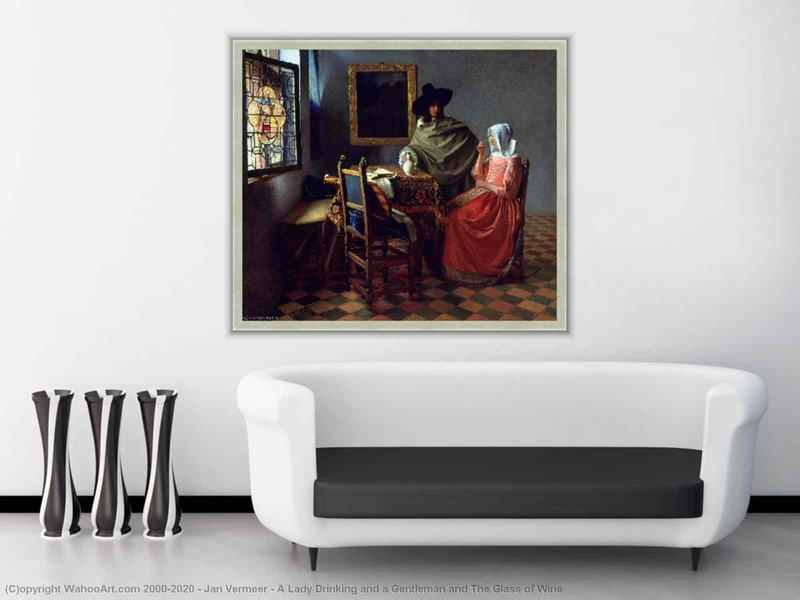 "A Lady Drinking and a Gentleman and The Glass of Wine"
Vermeer was about 27 when he painted The Glass of Wine, and according to the critic Walter Liedtke, "No analysis of artistic conventions can suggest the sheer beauty and extraordinary refinement of a painting like The Glass of Wine, which may be considered one of Vermeer's first fully mature works". The concept of figures drinking around a table, and the portrayal of a woman drinking from a glass are taken directly from De Hooch's A Dutch Courtyard. However, Vermeer's work breaks away from the prototypes of De Hooch in that the interior is rendered in a far more elegant and higher-class setting than the older master's works. The clothes of the figures, the patterned tablecloth, the gilded picture frame hanging on the back wall, and the coat of arms in the stained window glass all suggest a wealthier setting. 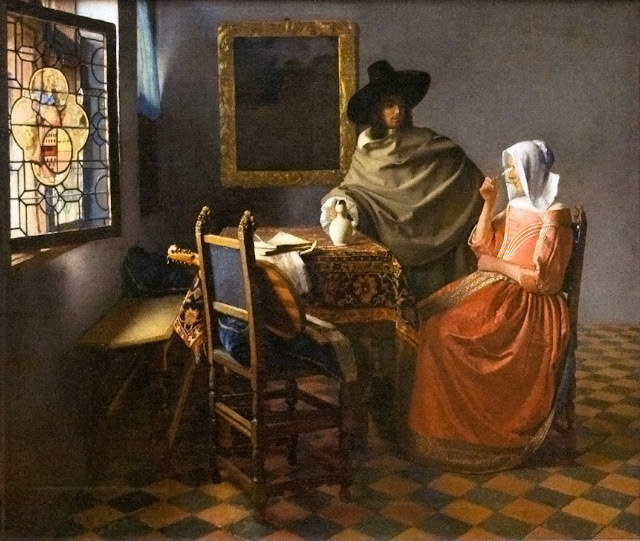 The scene likely represents some type of courtship, but the roles being played by the two figures are not clear. The woman has just drained the glass of wine and the man seems impatient to pour her more, almost as if he is trying to get her drunk. A musical instrument, the cittern, lies on the chair with musical notebooks. But the figure of Temperance is depicted in the stained glass window, adding to the tension in the scene.